Preheat oven to 450 degrees F. Steam the asparagus in a medium sized steamer pan on the stovetop OR in the microwave until tender crisp. While the asparagus is steaming, combine the flour, Real California Milk, eggs, and salt in a blender and blend until smooth. 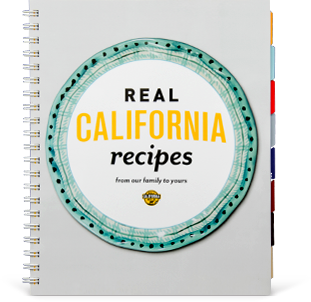 Melt the Real California Butter in a large cast iron pan or ovenproof dish over medium heat. Add the steamed asparagus, plus fresh ground black pepper to taste, and saute for 1 minute. 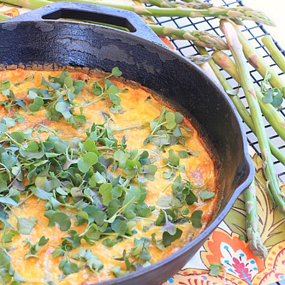 Pour the batter over the asparagus in the pan, top with the Real California Monterey Jack cheese, and transfer the skillet to the oven to bake for 15 minutes, or until the pancake is puffed and golden brown. Cut in to wedges, top with microgreens, and serve while still warm.